You know when you're younger, in your late teens/early twenties, and you have this grand delusion that you're invincible? That wide-eyed delusion that you're going to be young and energetic forever, able to eat cheeseburgers all the time without gaining a pound, able to see your friends all the time without really trying. Then as you start getting older, the slow realization creeps up on you that you're going to have to work really really hard for your health and happiness? Tell me I'm not the only one. Don't worry, I'm not going to get into an existential conversation about how to find happiness in life. But I definitely need to start eating better. Every week I tell myself I'm going to eat more veggies and less cheese/bread/ice cream/etc., but I'm always so wrong. Last night at 9:30 pm, I got a wicked craving for rocky road ice cream and left to go buy some from the deli down the street from my apartment. They were already closed. I didn't realize that they close an hour earlier on Sundays, my mistake, but I still took it as a sign from the universe that I need to stop being such a fat cat. I need to start eating more salads like this. Colorful, refreshing, filling, and really tasty. I've tried making different types of farro salads before (with pesto, tomato, and mozzarella à la caprese salad, with maple glazed winter squash) but Phillip doesn't really like farro. Surprisingly, he said this was his favorite farro salad so far. I'm taking that as a win. 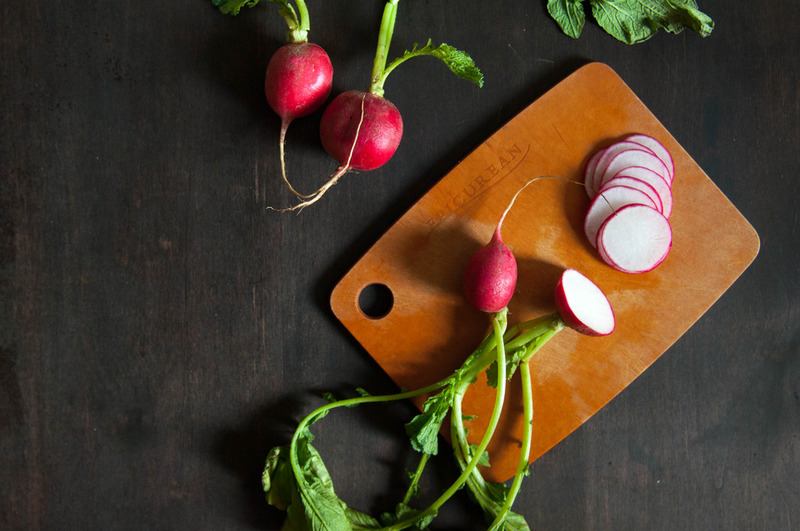 This salad is sweet and spicy (from the watercress and radish) at the same time. If that's not your thing, you can definitely substitute spinach for a less spicy green. I've listed the option below. Alternatively, if you don't like any of the veggies I have here, feel free to use anything you like. 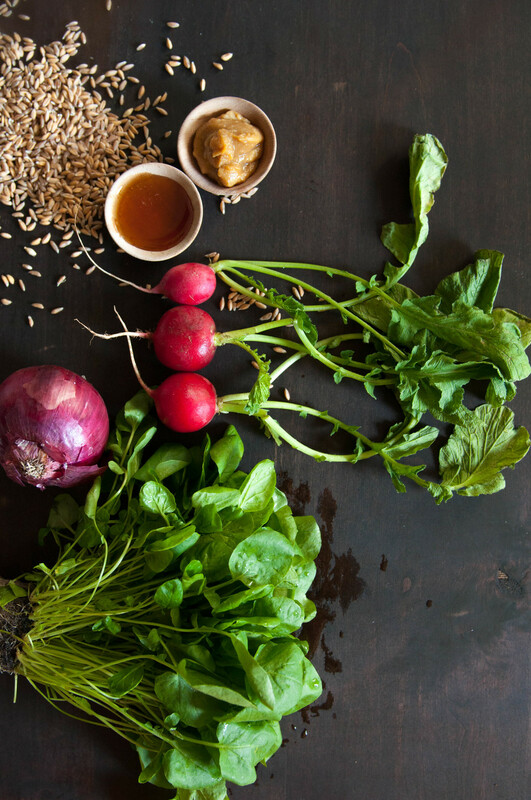 The farro and miso dressing are the integral parts of this salad, everything else depends on your own tastes! In a food processor, blend all of the dressing ingredients until smooth. In a medium saucepan, rinse the farro a few times over. Add water and salt, bring to a boil, turn heat to low, cover, and simmer for 30 minutes until cooked through. Drain (and rinse if you'd like) and let cool to room temperature. In a small to medium bowl, soak red onion in cold water for 10 minutes. This removes the bite and makes it milder. Drain and pat dry. 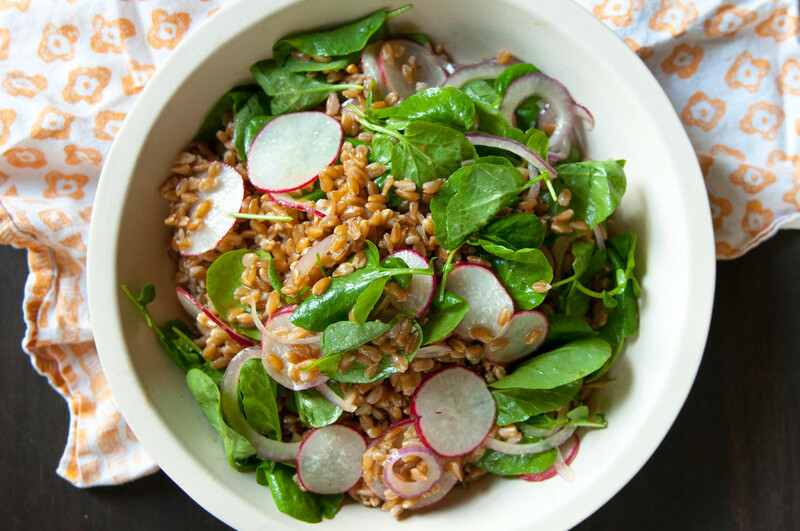 In a large salad bowl, add cooled farro, onions, watercress, and radish. Drizzle dressing on top, toss, and let sit for 10 minutes to let the flavors marry before serving.